Speak to your school secretary, if your child attends one of these schools and is interested in attending. After School Clubs and Breakfast Clubs are run by qualified gymnastic coaches. They take place immediately after the school day has ended/before the day starts and are for the children who attend that school. The children use the school’s gymnastic equipment as well as equipment brought in by the coach. They learn basic gymnastic skills i.e. forward rolls, cartwheels, handstands, as well as how to use a spring board and vault. The gymnasts also work on The British Gymnastic Badge work scheme. 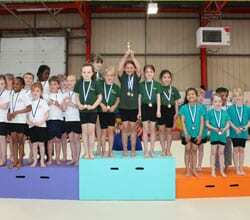 They are invited to take part in the Annual MK Primary Schools Gymnastics Competition at our Kiln Farm gymnastics centre. Speak to your school secretary if your child would like to attend. We have several community coaches who can come into your school and work with the children either with the teacher sharing our gymnastic expertise or offer PPA cover. There is also an opportunity to work from our fantastic gymnastic manual; it’s simple and easy with lots of progressions ideal for the school environment.